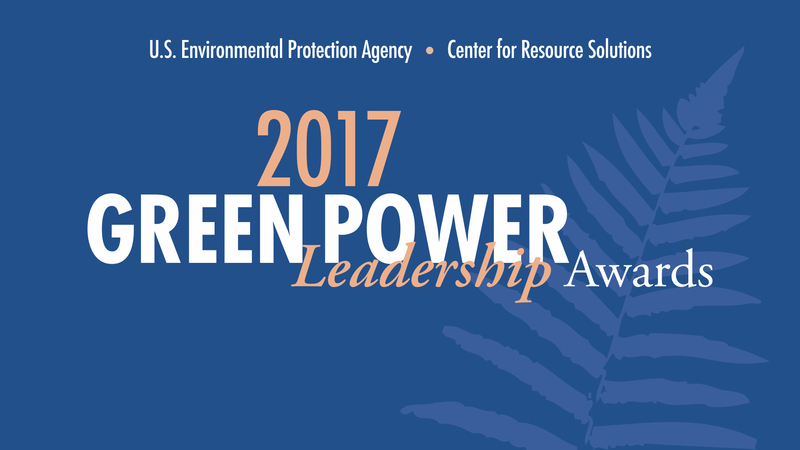 The U.S. EPA Green Power Partnership also recognized 19 Partners in four categories: Excellence in Green Power Use, Direct Project Engagement, Green Power Community of the Year, and Green Power Partner of the Year. More information about EPA’s recognition is available at www.epa.gov/greenpower/green-power-leadership-awards. Green Power Market Development: A Better City, Google Inc., Pacific Gas & Electric Company, Rocky Mountain Power, and WGL Energy. International Green Power Market Development: Apple Inc. Leadership in Green Power Education: Clif Bar & Company, Phipps Conservatory and Botanical Gardens, and RE-volv. Green Power Leader of the Year: Jan Pepper, Peninsula Clean Energy. Renewable energy generation remains on track to be the fastest growing source of electricity in the country for the third year in a row, with more than 10 percent growth in the first half of 2017. This year’s award recipients were selected for their commitment to increasing green power use, from installing green power on-site to innovative purchasing. The awardees were selected based on many criteria, including the size and scale of their green power use, leadership and innovation in purchasing and generating green power, internal and external communications efforts, as well as organizational strategy for investing in green power.